Memoirs Writing at the Brandon Public Library | Southwest Branch - Manitoba Genealogical Society Inc.
Are you looking for inspiration to write your memories and stories? 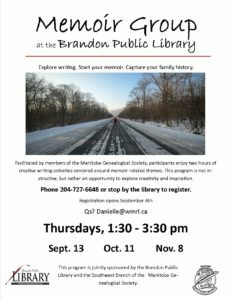 Brandon Public Library and South West Branch Manitoba Genealogical Society are hosting 3 sessions of Memoir Writing this fall: Thursdays: Sept 13th, Oct. 10th and Nov. 8th from 1:30 – 3:30 pm. Limited space, No charge, for more information click on Memoir Writing Poster. Please register by email or phone – Danielle@wmrl.ca or phone 204 -727-6648.